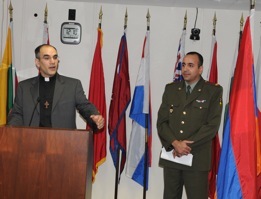 Tampa, Florida – On February 1, 2012, a reception on the occasion of the 20th anniversary of the establishment of the Republic of Armenia’s Armed Forces was organized at the US CENTCOM Coalition Coordination Center (CCC), Mac Dill Air Force Base. 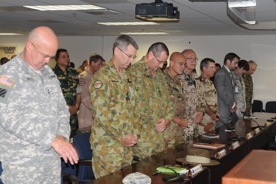 The event brought together high-ranking officers and civilian officials from more than sixty countries, including top US Armed Forces representatives of US CENTCOM. Lieutenant Colonel A. Mkrtchyan, Armenian Armed Forces representative for US Central Command, delivered opening remarks and presented the Armenian army’s history. In his turn, US Central Command Chief of Staff, Lieutenant General Karl Horst extended his well wishes to Armenia’s Armed Forces, and highly appreciated the Armenian military contingent’s participation in the security and stability operations in Afghanistan. Fr. Hovnan Demerjian, Pastor of St. Hagop Armenian Church in Pinellas Park, Florida offered remarks on the common strengths of Armenia’s Army and its partners based on protecting freedoms of religion, conscience and human rights. Fr. Abraham Malkhasyan, Visitng Pastor of St. Haroutiun Church in Orlando, offered the traditional prayer before meals and blessing for all who serve and protect in the armed forces. Twenty years have passed from the memorable days when the Armed Forces of the newly-independent Republic of Armenia were created. During those years the Armed Forces performed a multifold task. While in the process of creation, the Armed Forces both defended the Armenian borders and people, and had to combat and win a major war. As of today, the Armed Forces of the Republic of Armenia is actively involved in international military cooperation, including peacekeeping and stabilizing operations in Kosovo and Afghanistan. Armenia proudly accomplished the task, with US and Polish troops, in Iraq in 2008. The Armenian Armed Forces will spare no effort to preserve peace and security for themselves and for its allies and partners around the world.